Axis Of Oversteer: We shall pass on the track, we shall pass on the grass, we shall never surrender! We shall pass on the track, we shall pass on the grass, we shall never surrender! Like a pack of rabid Jack Russells these Minis give Mustangs and Galaxies no quarter. Yes, the big Yank Tanks have the advantage in the straights but come the tight stuff at Silverstone and the tiny wonders mug them on the inside, the outside, on the grass if needed. Brakes? They don't need no stink in' brakes, Brakes only slow you down! 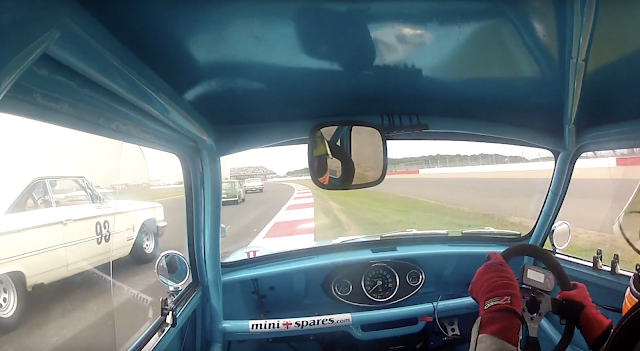 You are riding with Endaf Owens in his Mini MkI at the Silverstone Classic Masters 2013. Clearly, Mr Owens is well aware of "the proper way to drive a Mini". The best racing I have seen for many many years. It had everything, powerslides, tripodding, dive bombs, super aggressive overtaking but still with plenty of respect for driver room and the list goes on and on and on. I was full on laughing at some of it. Ie, Early on when the two mini's dive-bomb that black and gold mustang, but one from the outside and the other up the inside. Just like he says at the end to his mate, "that was bloody unreal!" That was a ton of fun to watch. Rabid Jack Russells is all I could think of watching and laughing all through it. They looked like they were having a ball, loved the hand waves between them as well. poor Mustang/Galaxy drivers, every time they tried to reach an apex there was a Mini sneaking in. Pure racing no computerized trickery. Just the driver and the car. Doesn't get and better than that!